[By Nick] Thank you to everyone who entered my Turkey Hill All Natural ice cream and Peanut Butter & CO. giveaway! Without a further ado, the winners of contest #1 are *insert drumroll* Ryan Cullinane and Michael Higdon! Please send your shipping address to nickrovo at gmail dot com and I'll be sure to get your prizes out to you right away! If you didn't win, don't worry because I have another contest for you guys. But first, let's take a look at Turkey Hill's latest limited edition flavor that's new for June/July of 2014. "But wait Nick, aren't you supposed to be promoting Turkey Hill's all natural ice cream as an ambassador?"? Technically yes but here’s a few reasons why I'm reviewing this one today. First, you guys all know my love for toffee so this was already on my list of flavors to review. Second, Dubba and I still have our competition to see who can review the most limited edition Turkey Hill flavors. Seeing as Dubba couldn't handle Gifford's toffee flavor, this was an easy point for me. Last but certainly not least, I do as I please! Enough semantics, I want some toffee ice cream. Well that certainly looks like the inside of a toffee bar. The ice cream also has a toffee aroma which I wasn't expecting. Dear Yankee Candle or Hershey's, make me a Heath bar car freshener thing, stat! There's also a good amount of toffee bits peeking out so all signs are looking good to me. Scooping some of the base only and this stuff is potent but in a good way. Well a good way for a toffee lover like me. There’s a strong buttery flavor with the right amount of burntness to replicate the flavor of toffee. It’s kind of impressive how close they got to the flavor without making it taste extremely artificial. The toffee bits are well distributed throughout the container and it's hard to get a spoonful without one in it. They taste a little off to me to be honest, but off in the sense that they have more of a butterscotch type flavor and are missing something. Looking over the ingredients, it looks like Turkey Hill decided to not include almonds in their toffee. That's exactly what's missing too. That little nuttiness the almonds add is noticeable to me. It's not that it's a bad thing but I want my toffee to have almonds in it. Actually, remember how Dubba wasn't much of a fan of B&J's Scotchy Scotch Scotch? Well that's what's going on over here. This flavor actually tastes like that if you get a good amount of the toffee bits on your spoon. Suffice it to say, I really enjoyed this flavor. Be warned though, this might be too strong for some people so have your expectations set if you decide to pick this one up. My only complaint is that I'd like to see some sort of swirl to go along with it. Maybe a caramel swirl to help balance the saltiness of the toffee flavors. I can easily remedy that situation on my own though. This flavor should be around until the end of July so it's very likely that I'll be grabbing another container before it's gone for good (or at least gone for the rest of this year). Dubba's 2015 Note: Since this flavor doesn't appear to have any almonds in it, I decided to bring a container home when it was on sale and I'm glad I did. Nick mentioned it might be a bit much for some, and it is for me, not so much for the flavor, but for how salty it is. This may sound strange, but it very much reminds me of Turkey Hill's Pretzel flavor. It's not a straight one to one of the flavor, but they are very similar in their saltiness and overall complexity. It's so salty that I can't really it it by itself, but when you add some caramel, oh man does this one come alive. It's actually a great morning snack because of the pep it has. So, if you have been tempted to try it, I say do it, just keep some caramel handy (and maybe some crushed Biscoff cookies for good measure). Okay, time for the second contest! I'm about to go all Lebron James on you. No I'm not going to cramp up. However I have not one, not two, not three, not four...you get the picture. I have 9 coupons for free Turkey Hill All Natural ice cream to give away. This time we're going to have three winners, each receiving 3 coupons each. I'll even throw in a coupon for a free jar of Peanut Butter & CO. as well as some Turkey Hill magnets just because. Now this contest is going to be twitter focused. Of course you can always earn an entry by commenting on this post. You all know one of my favorite mix-ins is toffee so I want to hear what your favorite mixins are in the comment section. To get a lot more entries however, you have to be following @OnSecondScoop and @NickRovo on twitter. Periodically we'll post a tweet about the contest. If you retweet it, that will earn you an entry. So depending on how many tweets we post, you can earn another entry each time you retweet! That's not all though. You can tweet this out to your followers to earn an entry as well: "Hey @TurkeyHillDairy, @NickRovo is the bestest #TRKAmbassador!" (Dubba's note: my apologies, the boy has no shame). You're able to do this once a day. The contest will last until June 30th 2014 11:59 PM Eastern Time. If you were to tweet that line each day, you'd earn a total of 15 entries. Now if that doesn't sound like an easy way to win some free stuff than I don't know what is. Get to entering and may the odds be ever in your flavor favor! What?! No almonds in their toffee?! That's what makes Heath Bars so delicious! 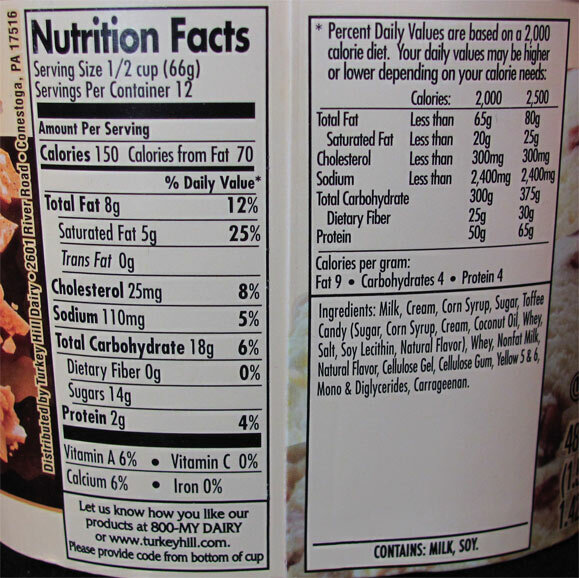 I think that's why I absolutely loved B&J's Vanilla Heath Bar Crunch so much. Do you know if the new B&J's Vanilla Toffee Bar Crunch tastes the same as their recently retired Vanilla Heath Crunch? I don't generally mix toppings into my ice cream at home, but I do tend to do the Magic Shell thing. Toffee and butterscotch are definitely easy to overdo...too sweet sometimes. I'm old school, so oreos and hershey's chocolate syrup are my go-to mix-ins/add-ons. oh, and plain M&Ms. Mmm. Stride, we've heard reports that the new toffee isn't all that good. I plan on trying it in the near future so keep an eye out! There is this brand of peanut butter I get at Wal mart called PB Crave. It is peanut butter with mix-ins such as chocolate bits, etc. I take a dollop of that and put it in my ice cream. Completely delicious combo! My favorite mix in is a toss up between peanut butter and oreo's. Perhaps I should try mixing in the new Reeses Oreo's. Favorite mix-in... Butterscotch chips & caramel syrup. My favorite mix-in is reese's cup bits. Best mix-in is peanut butter cups! Oh fun! My favorite mix-in's are Oreo cookies or Reese's! Yummy! it depends on the ice cream flavor! i like waffle cone pieces, cookies, chocolate flakes (as opposed to chips/chunks), and brownies... to name a few. My favorite mix in are any kind of cookies, Reese's, Toffee, and Almonds. I just Love adding anything I have at the house. I looove oreo's and reese cups- yummmy. I'm eating TH Butter Brickle right now! I think it's good - tastes like the butter brickle I remember from my childhood in the 60's. I generally get ice cream with peanut butter or nuts mixed in. I like to make a sundae with Amy's Organic Chocolate Cake and any kind of hot fudge! And also mini reeses peanut butter cups are pretty amazing mixed in too. My favorite mix-ins are any kind of nuts - almonds, walnuts, pecans! Yum! I always like to throw in a handful of something salty or umami-ish like potato chips or cheez its! I guess it's to balance out the intense sweetness of the ice cream. 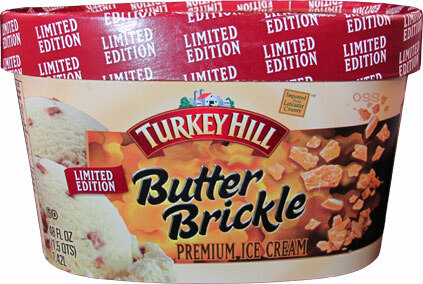 I think this butter brickle ice cream is definitely comparable to Friendly's butter crunch flavor so fear not when this limited edition is gone! Not a good flavor at all. Having it now. Butter Brickle does NOT have almonds, not sure where you guys are getting this from. 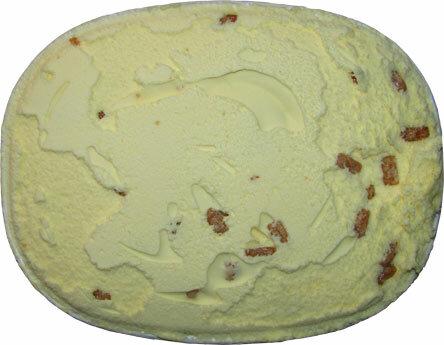 It's called BUTTER BRICKLE because it contains toffee and butter. 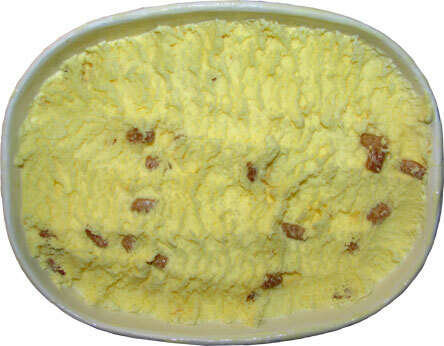 BUTTER ALMOND BRICKLE is what contains almonds. Not Butter Brickle. Got it? Good! Not buying again. But may have to get some toffee bits to throw into my next ice cream batch! ...welcome back. You may apologize now. "Toffee is a candy made by caramelizing sugar or molasses (creating inverted sugar) along with butter, and occasionally flour. The mixture is heated until its temperature reaches the hard crack stage of 149 to 154 °C (300 to 310 °F). While being prepared, toffee is sometimes mixed with nuts or raisins." That means, IT IS NOT REQUIRED TO BE PUT IN BUT MIGHT BE to make Toffee. So please, it does not say "ENGLISH TOFFEE"
But because you mentioned the almonds I added crushed almonds to this. Heavenly. Are you the same anon YELLING again? I HATE PEOPLE THAT FEEL THE NEED TO TYPE IN ALL CAPS. IT'S ANNOYING. DO YOU FEEL CAPS MAKES YOUR POINT BETTER BECAUSE IT ACTUALLY MAKES YOU LOOK LIKE AN UNINFORMED JERK. Spacing things out just emphasizes this even more. Manners, it's called manners. We welcome all opinions here when they are said in a civilized manner. Please keep this in mind. Never said almonds were required, I was pointing out that it was a possibility.